The city has seen three years in a row of record sales and two years of rising prices, and the Miami real estate market shows no signs of letting up. The market in Florida’s principal city started out the year with strong sales, robust prices and new listings. In January, residential real estate sales increased 11.6% year-on-year, according to data from the Miami Association of Realtors. The rise was sharper for condominium sales than for family homes – single family homes saw a rise of 9.8% year on year, while condos rose 12.9% the same year. Prices have increased more than sales, with the average sales price for a family home rising 32.3% year-on-year from $308,978 in January 2013 to $408,626 in January of 2014. The average sale price of a condominium rose by 24% in the same period, from $290,378 a year ago to $361,295 in January this year. The rate at which prices are rising is accelerating, too. In January, family home prices rose by 16% to a median $225,000, and condo process jumped 24.4% to $186,000. Condominium prices have been rising for slightly longer than family homes too. Condo prices have now been rising for 31 months, while family homes have seen a few months less – 26 months. Ms. Mendez believes the balance that’s being restored to the Miami market comes as sellers are tempted onto the market by rising prices. Backing up her thoughts, the figures for new listings show single family homes listed 13.8% more in January 2014 compared to a year ago, while condo listings rose by 20.1% in the same period. 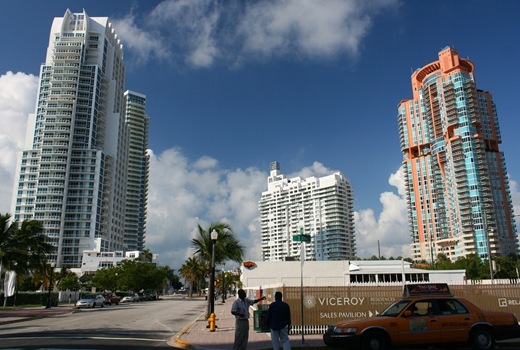 The Miami Realtors’ Association considers these rising listings a reflection of the success of its campaign to encourage owners to sell during the 2012-2013 years when Miami experienced a shortage of housing stocks. ‘The current performance of the Miami market reflects seller confidence. Home owners in Miami have recovered value lost during the downturn and have realized it’s a good time to sell, which is bringing much-needed supply to the local market after years of very limited housing inventory,’ says Francisco Angulo, residential president of the MAR. At the current sales pace, there’s a 5.6 month supply of single family houses and a seven month supply of condominiums, an upward shift of over 20% on last year’s figures. Other figures indicating a healthy market show Miami real estate selling quickly and usually close to the asking price, with the median number of days a house spends on the market falling year-on-year by 2.1%. The average percentage of the asking price a Miami home sells for is 95.4%, showing a modest 1% rise from a year ago and indicating that pricing is accurate to the market value. For condominiums, the average percentage of asking price was 96.1%, showing a slight 0.7% decrease from last year. The number of cash sales fell slightly over the last year and all-cash sales accounted for a declining percentage of both condo and house sales. This indicates that the percentage of cash-rich buyers is falling, an indication that the Florida market in general and the Miami market in particular is reliant on broadbased support from residents and second-homers, rather than on investors and developers. The Miami market offered great investment opportunities a few years ago, but investors were stymied by low inventory. Overseas buyers have been a traditional prop of the Florida market, but it looks like it’s a market with a future, but not an unsustainable bubble waiting to burst. Maybe it’s that new balance Ms. Mendez spoke of.